I need to work on information filtering. I always have to go back at the end and fill in some spaces that I left myself. Also keeping my handwriting neater when I am rushed. Very strong capture of all main points with good distillation of text. Long enough phrases for good referral and rentention. A little more white space, breathing space around block letter and such to make text clearer. Ex. the text along the long, green, horizontal arrow mid-page. Love the title emphasis, use of arrows for flow and balance of imagery to wording. Would have liked to see numbering for additional reinforcement of flow, green dots for all bullet points. Green highlight works well; great title text too! I like your use of colour to structure the page and draw attention to some points. The sketchnotes feels really well balanced in terms of capturing main points, adding enough detail and visualising concepts. The big banner that separates the two halves of the talk works really well to structure the page and to introduce the second part of the talk. If you want to improve on your use of colour, try using it to highlight the actual content / key points rather than the arrows inbetween. It is tempting to fill the big arrows with colour to give the overall look some balance and rhythm, but from a information clarity point of view, it is better to use colour as an accent where you want the eye to be drawn to. You use this very nicely in the filled banners and big numbers already. In some of your sketches I also noticed that you use lots of little strokes to form a line (for example in the building of NYC or the brain that gets squished). Try practicing sketching things with one clean continuous line. Even if the line is sometimes not perfectly in the right spot, it will make your sketches calmer, cleaner and easier to ‘read’. Found that particular talk tricky since it was SO dense - so many ideas and metaphors thrown in there it wwould have been impossible to caprure them all. It emphasised to me the importance of having the confidence of deciding what is important to you. 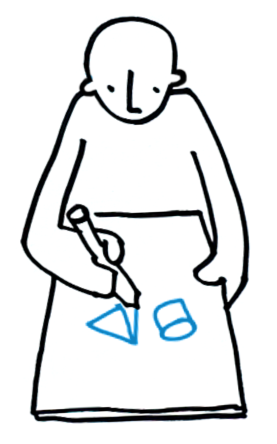 The act of doing a sketchnote that you know will (or might) be shared subtly changes how you think towards it. I find that I'm happy with a sketch-note if I think I could talk someone through a decent precis of a talk based on the notes. This one passes that test for me. 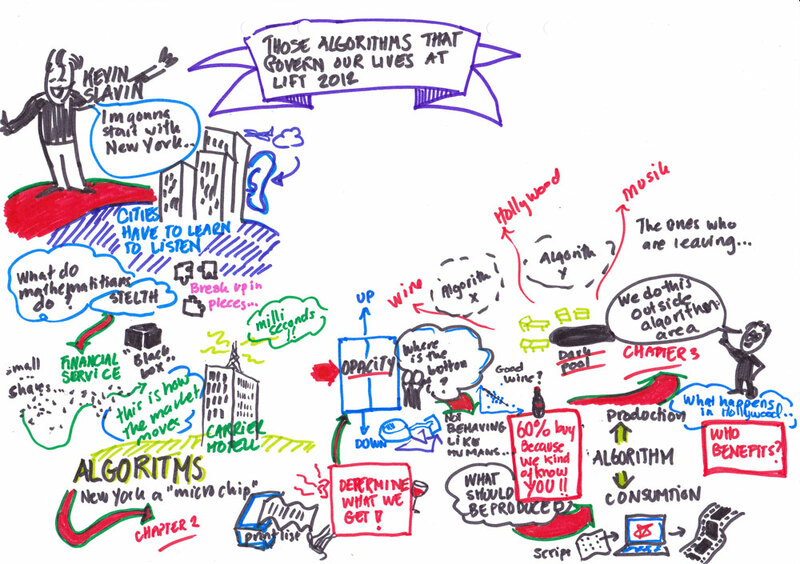 I felt that I didn't really capture one big idea - but the subject seemed to be all about how algorithms have become pervasive and what might be the responses, so maybe that's reflected? I've been working recently on a different kind of sketchbook for the past few months. I found this one being thrown away in work, and it's got lovely shiny paper that takes ink really well, but is a little slow to dry. It's making my notes use more blacks since it's so enjoyable to let the ink flow. 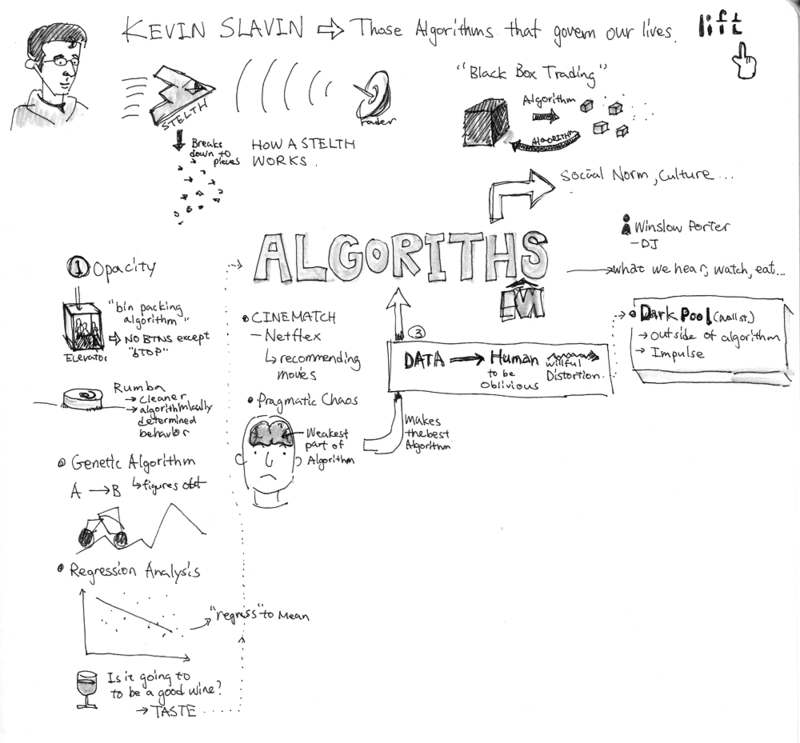 It would've have been nice to draw up some references to the visuals that Kevin Slavin used in the talk, and some of the great images he suggested, like cities listening. I think that a really good talk can be strangely hard to sketchnote since there's less 'dead time' in the talk to catch up with the drawing. Very solid use of imagery and text as images. Curious how you'd work with a landscape/horizontal page, or across the double page spread. Would love to see more flow and connection between the ideas. Like the title area of the sketchnote, use of imagery too. Empty space in the lower right makes the rest of the structure feel compressed. Work on opening up your elements a little more to accommodate the page. Like the thicker line around the outside of the wine bottle ... would have liked to see this effect used more throughout! Also liked the caricature of the speaker and the variety of typefaces. You have great sketches in your notes. I like the quality of your lines and the simple but dynamic way of sketching objects (the printer with the paper coming out is great). Lots of personality. You could try experimenting with adding more structure to your notes. Right now, you have a lot of different styles, sizes and visual elements going on. This is great to create some visually interesting and diverse notes, but makes it a bit harder to see the structure and how things hang together. Try choosing one style of lettering for main points and one style separator or frame to group things and use these consistently throughout one talk. I think it will make your notes easier to process and skim afterwards. If the consistency gets boring, you can always change styles between talks, but within one piece, try reducing styles to enhance the readability. My dividing lines need to receed relative to the points 1 through 5. I like the loose, meandering feel. Good sense of organization and levels of information within each section. Yes, a lighter color for your dividing lines would help show the 5 sections while looking less sliced up and separate. Good use of the page and white space, use of imagery is pretty good too. Would like more emphasis on the title area, lower portion of the sketchnote feels a little more cramped than the upper area, though that can be tough to gauge. I'm a sucker for type empathy, so I dig that the word STEALTH begins to disappear. Nice. I like the page structure here too. I like how you used lettering to visualise the meaning of Stealth within the actual word by making the ‘H’ disappear with a dotted line. I also like your little bar diagram, visualising the realtion ship between the length of pipe and the amount of money made as a result. You also structured the talk into very clear chunks of ideas. I suggest that you could try playing around with colour in your next sketchnotes. Colour is a great way to create visual hierarchy and to make key points stand out. Try using one single highlight colour to make the key words stand out. It will enhance the structure and the scanability of your notes. Kevin's presentation is well structured and punctuated with lots of stories, analogies and metaphors; lending nicely to the imagination and easing the process of synthesis. It was an interesting talk and fun to doodle. 1. Dividing the page in two helped with the layout. 2. Keeping an eye on the clock helped pace the space. 3. Writing keywords and moving on; knowing I can return later to fill in the gaps from memory when the talk slows, repeats or ends. 1. Cleaner structure and more obvious flow. 2. My ability to synthesise - reduce the urge to capture everything. Love the open-ness of the page. The linework is nice as well. Fantastic capture of the ideas and good complementary imagery. Each piece is roughly the same size, so it is hard to see what points are more overarching headlines and which are supporting details Trying playing with scale more to bring in more organization. Listen to ascertain what concepts feel bigger. Really nice use of white space and elements on the page. You've done a great jpb of spacing these out visually so they feel very balanced. Love the highlight colors added to the sketchnote as well. Financial services stack of digital documents breaking the square is a nice visual touch. Overall I really like the simple line drawn icons and images - super clear. A, B, C, D markers are a great solution for flow direction. I think the only real addition I could see here would be a bolder, more pronouced title area up top. Because it seems very similar to the body, it doesn't immediately mark the talk name or speaker. 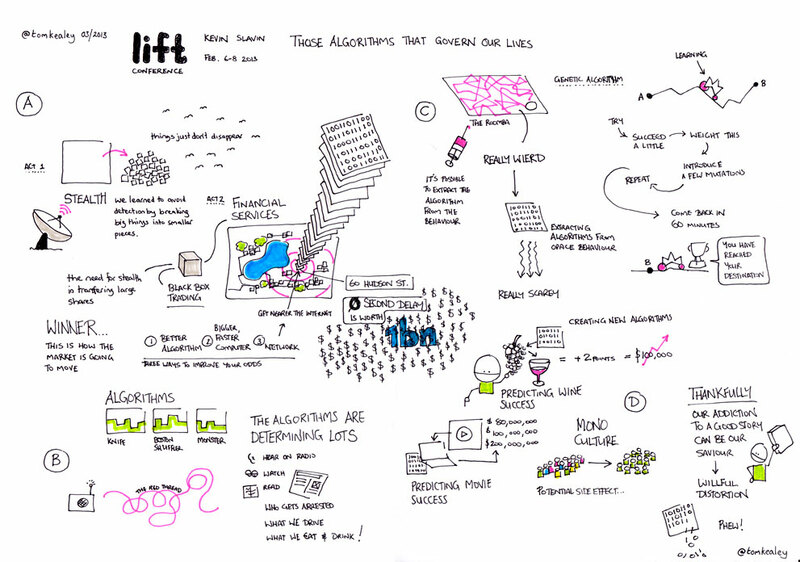 LIFT is well emphasized - I would like to see the talk title and speaker more emphasized as well. Comprehensive, plus the subtle use of colour works well. 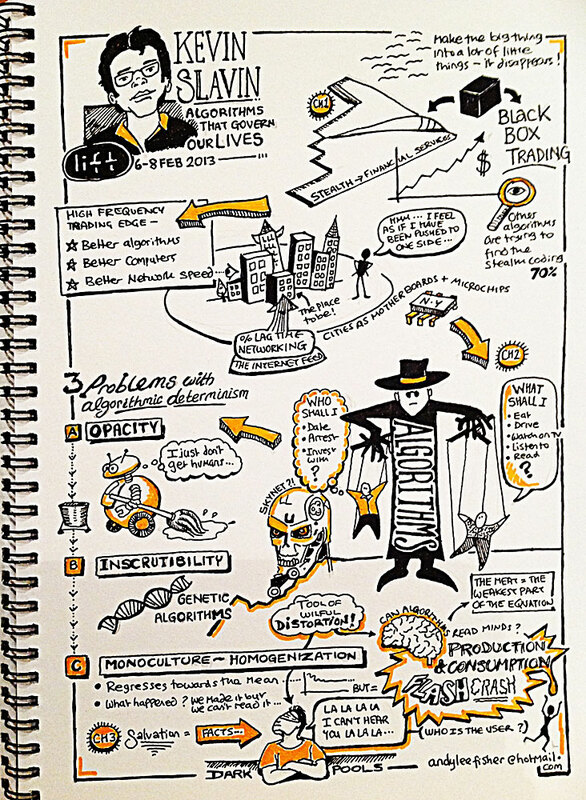 Your sketchnote has a great balance of concept visualisation and detailed capturing. I like how the text parts complement and explain the sketches (for example in the first part about stealth) and how the sketches visualise key points (for example the visualisation of mono-culture: very nice and clever use of colour). You have a very nice use of whitespace going on that makes each idea stand on its own. You could try to use frames to group several ideas that belong together to make the overall structure of the talk stand out more. You started doing this by labelling the different sections with A, B, C and D, but using actual borders and frames would help to make it very easy to see these parts at a glance. I think generally I was pleased with the decision to use a 'path' approach and by the interplay of images and text. I sketched out all my key ideas in pencil and then inked them, added to them and coloured the Sketchnote while I listened to the talk a second time. Handwriting is a little clunky in places, the keynote speaker's portrait is distorted due to the angle I was sitting at when I sketched it and I was annoyed that I didn't leave the room to fit all of my email address in on the same line! Logical AND emotional. This is a really nice page! I almost don't believe you did this all in the time it took to listen to the lecture! Great use of scale and organization. Treated the page as a whole composition. Very strong. Since you penciled in first, try squinting to see the density of the information over the page. This may have helped you spread the pieces out more to lessen the squished, dense information in the bottom third of the page. Very nice illustration style. Like the title section top left - clear where the reader should begin. Great mix og description and visuals here. Love the little icons spread across the piece and how you have marked A B C as well as CH 1, 2 and 3 with markers. Orange makes a very nice highlight here. Not much to improve on here - you have found a nice balace of words and images, good spacing and structure. Maybe the base of the piece feels a little more tightened than the top, as though you were working hard to keep everything on a single page. What's not to like? Great illustrations, cool caricature of the speaker, nice splash of colour ... I think the pupper master is my favourite. Clearly not created within the 30 mins of the talk ... but it looks so damn good that I'm prepared to turn a blind eye to this fact. Great notes. Clear sketches and handwriting, great use of structure, space and colour and some lovely visual metaphors in here (like the puppet master and the blindfolded guy). I like how you injected little stories into your sketches by making the object / people talk. The only part I can find that is a bit weaker than the other is the one about the cities and the connection between the internet connection and the real estate prices and shape of the cities. This connection got a bit lost. I like the fact that I was able to draw some kind of a big picture and that I didn't throw in too many colours. Can one ever be satisfied with the end result? I would have liked to emphasize the algorithm part a bit more. Is the main thing lost there now? Or does the big picture cover it? 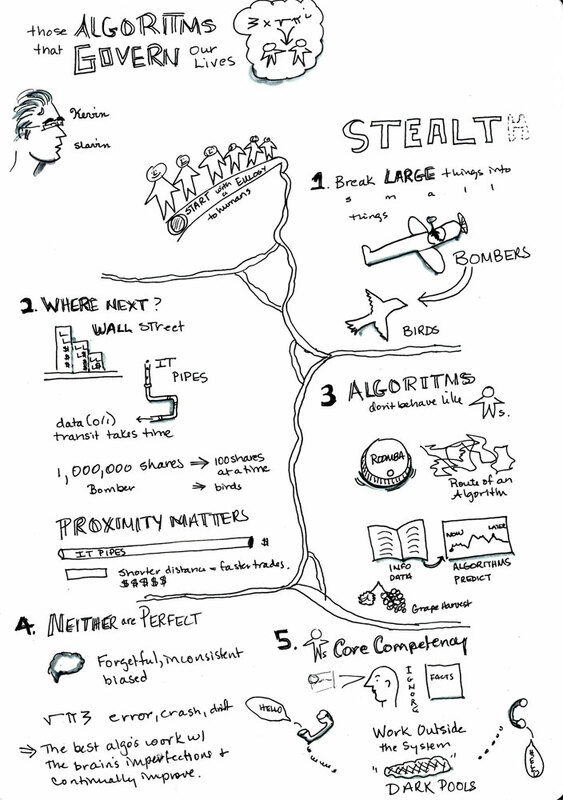 I also seem to have nearly non-existing hierarchy in my sketchnote, as usual. But that's just how it is with my brain: the ocmplex structures might end up into a result - or not. Limited color palette, confidence in line and use of scale make this a very strong visual. Curious how much of the content you would retain with so little text? I love the mapping of the head profile here. Initially I didn't even see it, so when I realized the sketchnote was mapped to a head, I had a moment of joy realizing it. Like the simplicity of black and orange with a little blue/black in the middle. Computer as master around the neck is great. Love the monster! I see there is a blue/black section in the middle for the Bank, but I'm not sure of the significance. Without hearing or seeing the talk, I wouldn't be sure where to start - I assume top left and down and then right, but that would be a guess. Lovely illustrative style, great use of colour. I love the visual richness of your notes and how you pulled it together with the big head chanined to the computer framing all the ideas. A really clever visual conclusion of the talk. Your sketches are very charming, too. 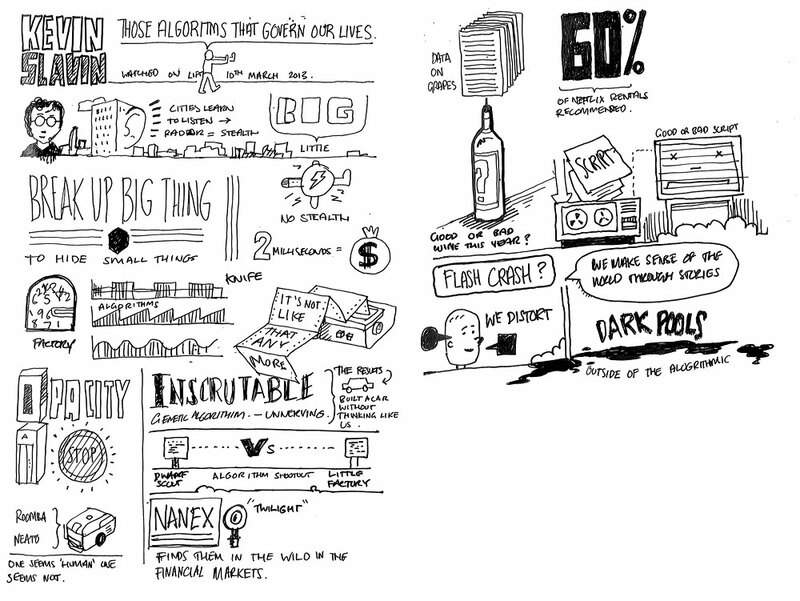 The main part of your sketchnotes is almost exclusively visual. I’d try to add a bit more language to some of the ideas, at least some overall keywords that summarise some of the concepts. This will make it easier for you to remember details later and for others to follow along (in case you’d like to share the notes for others to see and use). I just followed the flow – didn’t stop and correct things. I was lost some times but came back on track again. I learned something about algorithms that affects me today (I have actually given it a thought already especially when it comes to music and films). I think if somebody asked me I could give a short summary of the presentation. The color setting: Too much? I tried to make a “red thread” through the story but I am not sure that it helps at all. I would use a thinner marker, or bigger paper—it feels a bit too thick overall. This would also give you more room, so you're not "stuck in a corner"
Simple icons that have a lot of life to them. Yes, I couldn't pull out the red thread with all the color going on. I recommend trying a there color palette: black, a bright/dark color (ex. red) and a tint/pastel of that color (ex. pink) Using less color to make more meaning. See what happens. Very bright, bold sketchnote style. Spacing could be better (empty areas on right page) and it feels a little rushed, Bright use of many colors gives a strong feeling - maybe limit colors to 4 or 5. Like the caricature of the speaker and the talk title ribbon! You are using a lot of colours. I can see how you are trying to use the different colours to structure the talk, but I think with 7 different pens, it is getting a bit too much and is not adding clarity. Try picking one or two accent colours in addition to the black and use them consistently for different levels of information, e.g. all key points in colour 1 and all sub points in colour 2. I’d also try using thinner pens as the lines get slightly too thick for your size of writing and sketching which makes everything a bit harder to read. I like the use of arrows as I think it helps the flow of the piece. I would like to improve my sketching of people and also the amount of information I capture whilst maintaining the flow of the piece. I also wonder if I could use colour a bit more effectively? Distilling of text is strong and font styles support the content. Good use of white space and use of whole page. Another way to use color is using a very light color that recedes to create containers around ideas and show flow. Really like the structure and whitespace of the sketchnote, use of color and arrows as well as simple, clear illustrated elements. Maybe the title above could be more impactful and bolder. Since this could be something you do before a live talk in practice, you could have this done before the talk begins. I love the overall look of the sketchnote. Your sketches and handwriting are neat and readable. I like how you chunked the examples of things that algorithms influence. 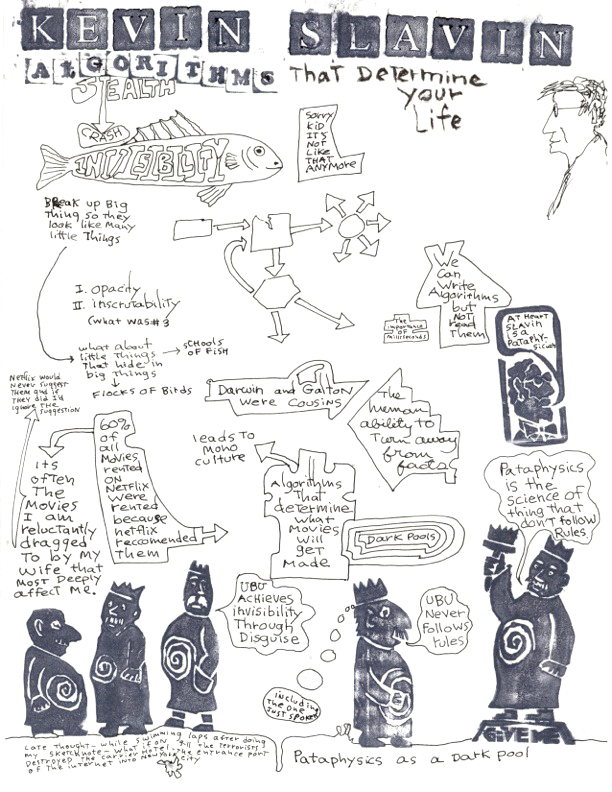 Overall I feel that you really got into great summarising in the 2nd half of the sketchnote. I’d try to add some textual detail / explanations to some of the points. In the first half of the notes (where you have the sketch of the city with the ear) the meaning and connections between the points (listening cities, the invisible and the black box) don’t seem clear. A few words of explanation could help (as you have done in the second half). I like how the protrait of Kevin Salvin turned out. I like the portrait! The general looseness is nice and casual. Good use of white overall and use of the 3D box to pop the last point off the page. Looks like you lost focus in the last third. Perhaps focus less on imagery to be able to get more content down. Even if it's tough to follow, try to get something on the page that may help spark your memory later, or you can build on it with a second listen. I could see you emphasizing areas a little more as it seems you have a fair amount ot space left on the page and are writing with small lettering. For instance, maybe Opacity could be larger to more clearly mark out that section (a solution could be to number and start the heading and come back later). I like the portrait and how you visualised the concept of 'Stealth'. It feels like you struggled a bit towards the second half of the talk. If you feel like you run out of steam, try capturing at least some key concepts as words. You can always add visuals and fill out gaps later when your energy is back. I'd also try and use more variety in sizes of lettering. Try making key points larger and bolder to really stand out at a glance. What do you like about your sketchnote / what works well? I like the combination of drawing, writing and the use of hand-carved rubber stamps. The 5 UBU's are part of an ongoing pataphysics project, but as the talk developed I suddenly realized the relationship between pataphysics and the threat of algorithms. More care, and faster drying stamp ink which doesn't smudge. I left the space for the stamps once I realized their relevance and used stamps for Kevin's name. I like the contrast between the formal and mechanical (stamped letters) and the hand written. I used 2 rapidograph pens (0.35 and 0.5) and a brush pen, but would like to do more with the brush pen because of its flexibility. My preferred art form is papercuts, and I'd like to think about how to incorporate those into my sketchnotes, but it would have to involve visualizing them. leaving space for them, then later cutting them and pasting them in. Looking at it upside down (so I'm not distracted by the content) I'd like a little more solid blackness in the middle. I'm not sure I understand where the stamps come from but damn I love them. The title and bottom anchor the page in such a handsome way. Very personal sketchnote. Appreciate how you're making new connections in your own learning while using your favorite methods. The boundaries around text feel constricted and confusing. Perhaps if the shapes were more fluid of in a lighter color the outlines would compete less with the text. Immediately drawn to the title and the gray markered figures at the base of the sketchnote. Like the fish illustration. Because the dark gray areas are so bold, the non-color other areas feel almost invisible by contrast. It seems with just some additional colors in the open areas, this sketchnote would have much more vibrancy. The shapes just under the fish are fascinating to me, but I don't know their significance - maybe labeling would help here. Feels like the information is less important than the drawings overall. I like how you added your own interpretation of the talk, connecting the ideas in the talk with a topic you are interested in at the moment and showing the parallels between the two. You could try to add some more visual hierarchy into you notes by using different sizes of lettering. Draw out main key words in big writing and add the details in normal sized writing. This will make your notes easy to scan. You could also try to distinguish the ideas from the talk and your own commentary on it, for example by using different colours.